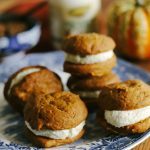 A perfect handheld treat to serve at your Thanksgiving table this week, these Pumpkin Whoopie Pies are soft and moist and perfectly festive! 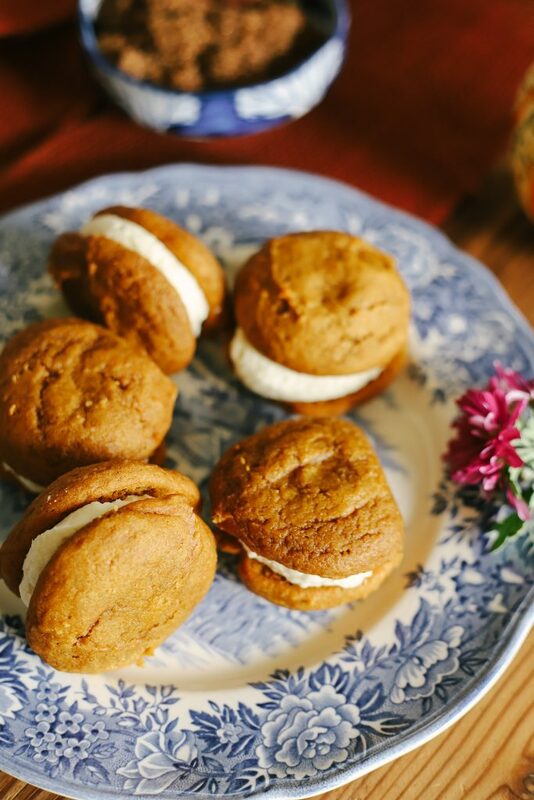 Whoopie pies are a Lancaster County tradition. You visit any type of touristy shop, and you’ll find them. 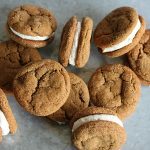 As a matter of fact, a few weeks ago a local grocery store had a “Whoopie Pie Extravaganza” where you could sample–I think it was up to 30 different varieties of whoopie pies. Crazy! The boys and I did stop in and sample a bunch and brought some of our favorites home for dessert later that night. 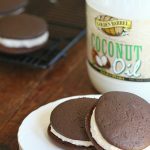 So whoopie pies are a pretty big thing around these parts. 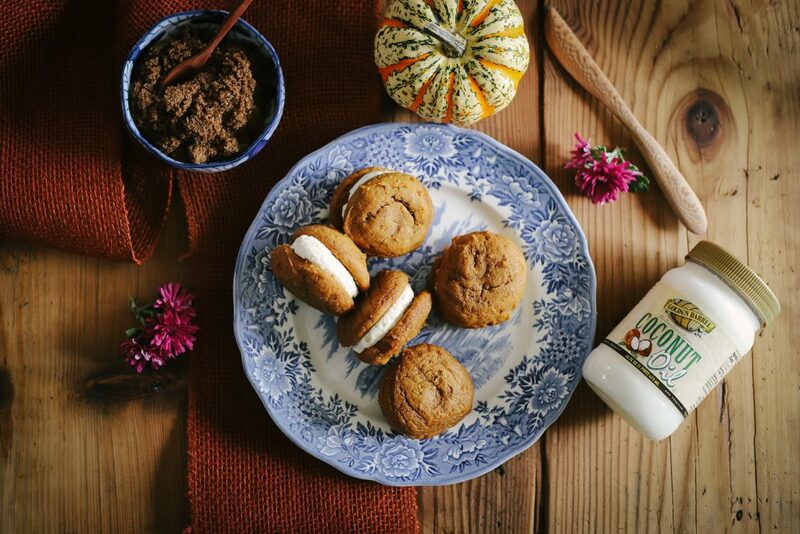 Just west of us in Pittsburgh as well as the New England states, these treats are called “gobs.” Call them what you will, they’re a sweet treat that are perfect at your holiday table. 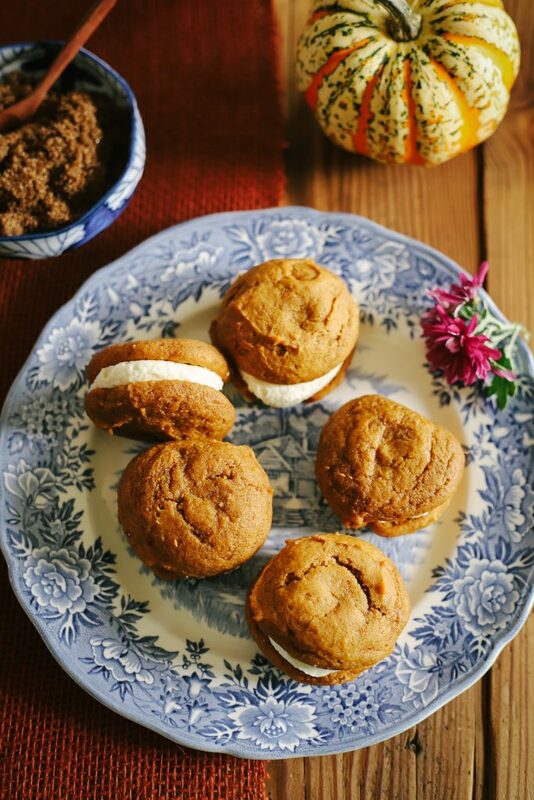 Traditionally, whoopie pies are made with shortening, both in the cake part as well as the creamy filling. I kinda hate the taste of shortening. The taste as well as how it makes me feel afterward. I don’t know…shortening and I aren’t friends. So whenever I see shortening in a recipe, I swap it out for Golden Barrel Coconut Oil. They’re both sort of the same consistency, so it’s a fairly easy swap. In the filling part, I used all butter for the fat. There’s no replicating butter’s taste. 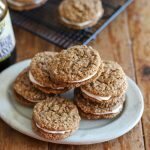 This filling is super smooth and creamy–it really is delicious. 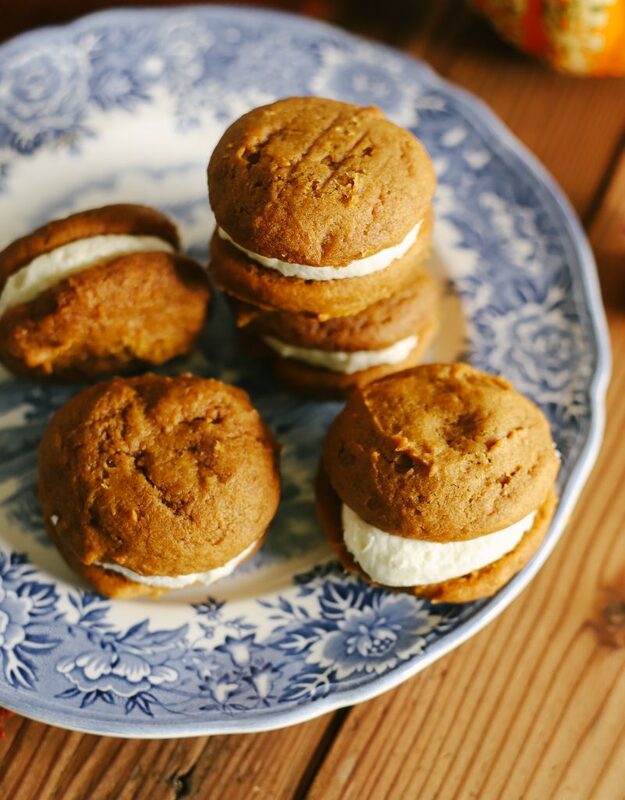 It’s the same recipe I used for these whoopie pies. You won’t be disappointed! 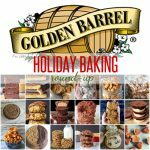 The cake part is made with Golden Barrel Dark Brown Sugar, which has a wonderful flavor that enhances the cake. That, in addition to two whole teaspoons of cinnamon, as well as some ginger. I’m not a nutmeg fan, but feel free to add 1/4-1/2 tsp nutmeg if you want. 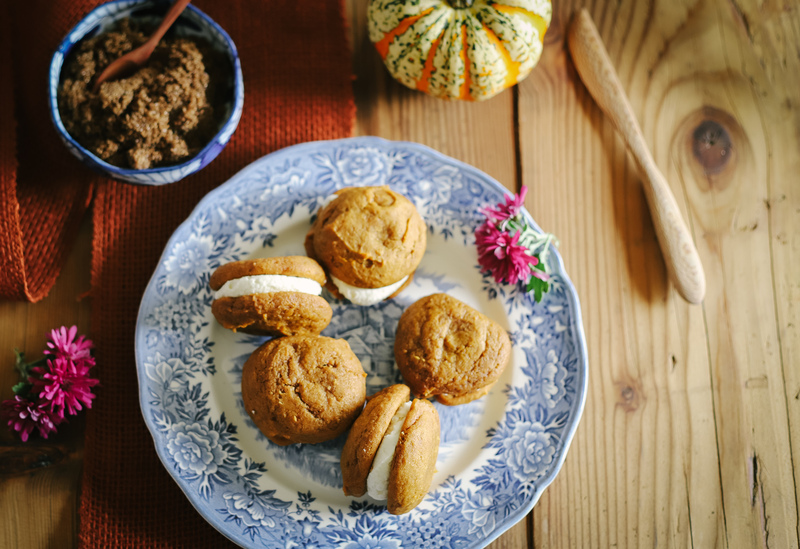 The spices are warm and welcoming and make biting into this whoopie pie a multi-sensory treat. Of course using Golden Barrel coconut oil keeps the cakes very moist, as well as a whole can of pumpkin. Yum-o. 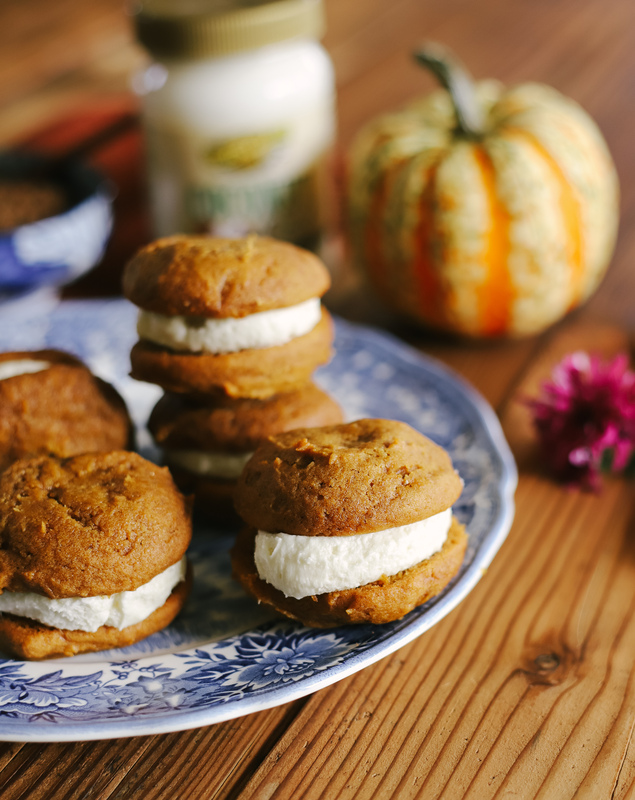 One thing all Lancaster County natives know to do when making whoopie pies is that you need to individually wrap them. Because of the moist cakes, they’ll definitely stick to each other and when picked up, you’ll notice a little patch is gone from your cake and stuck to its neighbor. So just take some plastic wrap and wrap each one. Yes, it’s a pain to do, but you’ll be glad you did. So add these little guys to your to-do list before Thursday. 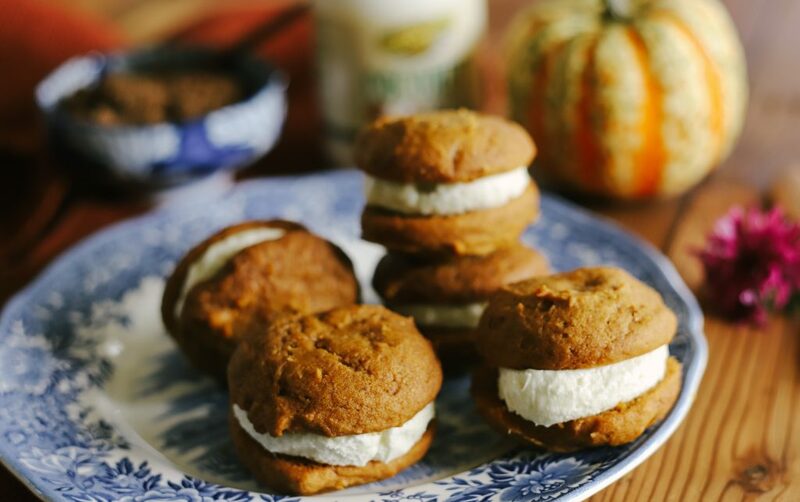 They taste better made ahead, so you have a few days to whip them up. Enjoy and have a Happy Thanksgiving! Preheat oven to 350 degrees F. Line baking sheets with parchment paper or use baking stones. Set aside. 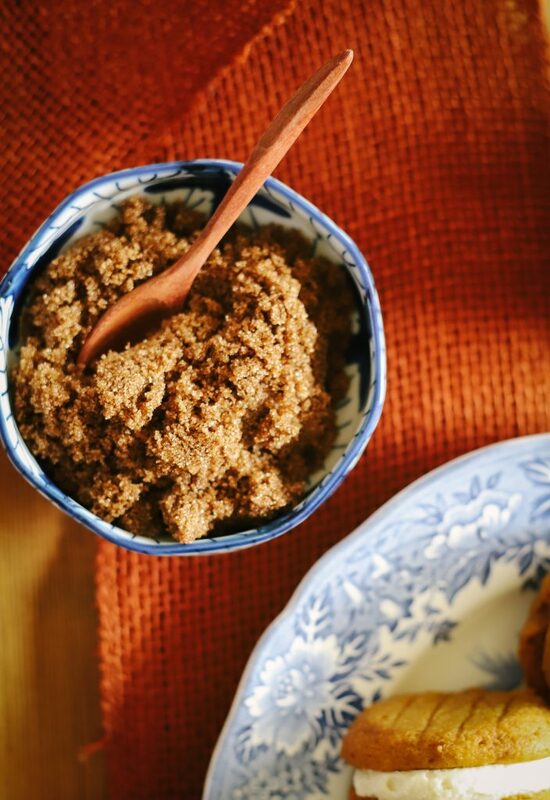 In medium-sized bowl, whisk together dry ingredients--flour, baking powder & soda, salt, cinnamon, and ginger. Set aside. In a large bowl attached to a stand mixer, mix together on low speed sugars, coconut oil, and pumpkin until combined. Add in eggs and vanilla until combined. With mixer on low, slowly add dry ingredients to batter and mix until just combined. Using a cookie scoop (whatever size you want--I used a medium one), scoop out dough on to cookie sheet and bake for 10-12 minutes or until tops feel done (or just slightly underbaked)when touched. Remove from oven and let cool on baking sheet for 5 minutes before transferrin to wire rack to cool completely. When cakes are completely cool, scoop cream filling onto cakes (I used the same size cookie scoop that I did for the cakes), covering with other side to make a sandwich.